Running an online business packed full of valuable products and services can be difficult to manage. Customers are going to have questions regarding what you have for sale, and being available 24/7/365 to answers questions, comments, and concerns, is challenging, even with a support team on hand. That’s why creating a knowledge base for your existing WordPress website is so helpful. A knowledge base is a section of articles dedicated to customers who prefer to troubleshoot issues themselves. They can be used to address additional customer support concerns, provide inspiration to those digging into what your product or service offers, and can serve as an education platform for anyone reading them. Today we are going to take a look at some of the most important reasons why you should consider creating a knowledge base for your WordPress website, and how to do just that using the free WP Knowledgebase plugin. As you can see, there are plenty of reasons why including a knowledge base on your website is a good idea. 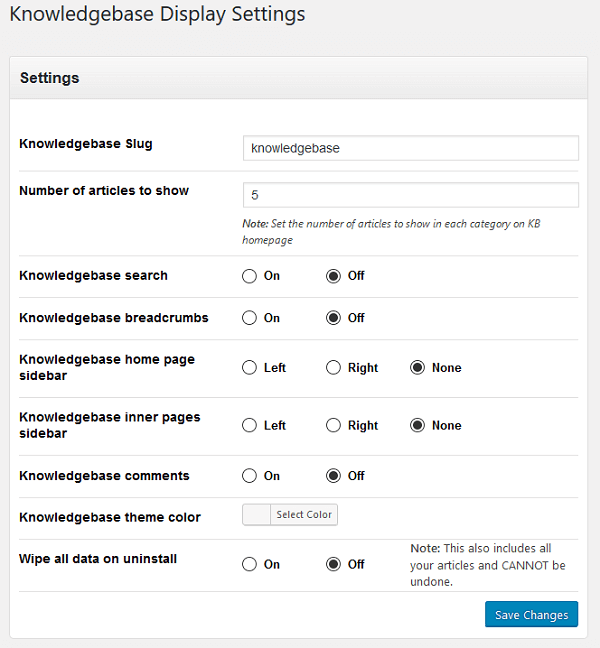 Now, let’s see how to do just that using the WP Knowledgebase plugin. WP Knowledgebase is a free WordPress plugin designed to help you easily create a custom knowledge base on your existing WordPress website. It comes fully responsive and is customizable to match the overall look and feel of your website. For instance, change the design by choosing a theme color, sidebar layouts, number of articles to show and more. In addition, enable the predictive text search and breadcrumb features, display comments if you want, and easily drag & drop the order of your articles for a more organized feel. Remember, this plugin is for those who already have an existing WordPress website and works by creating a custom post type for your site. If you haven’t started a WordPress blog yet, you will need to do things like register a domain name, enlist the help of a high quality WordPress hosting provider, and install WordPress onto your website before getting started. 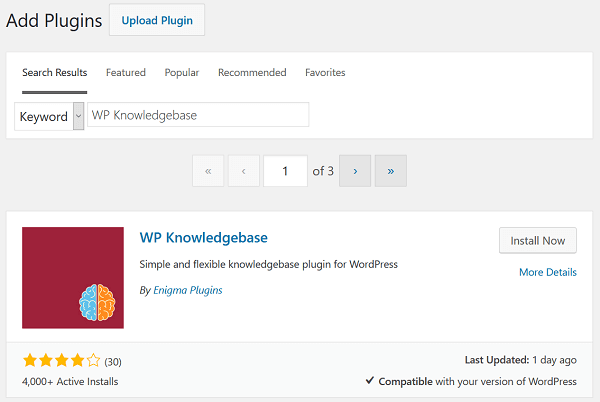 To start, navigate to Plugins > Add New and search for WP Knowledgebase. Select Install Now and then Activate. Notice the new menu item Knowledgebase is now in your WordPress dashboard. In addition, you will notice a message displayed thanking you for using WP Knowledgebase and asking you if you would like to have a Knowledgebase page automatically created for you. To make things easy, click on Create page. I will come back to this later on. Navigate to Knowledgebase > Settings to configure your display settings. Configure your settings and select Save Changes. 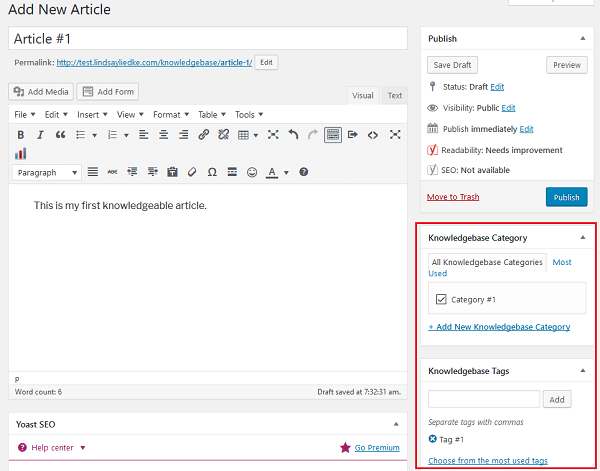 Before you jump into adding articles to your knowledge base, you should create knowledgebase categories and tags first. 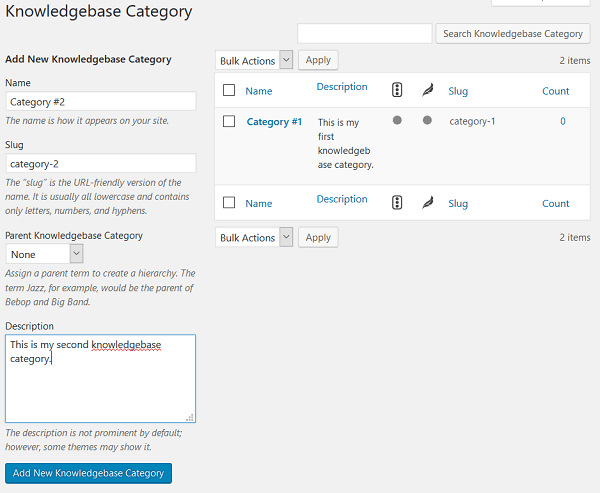 To create categories, navigate to Knowledgebase > Categories. From there, fill out the category name, slug, assign a Parent Knowledgebase Category, and add a description. Then click on Add New Knowledgebase Category and create another one until you have enough categories. You will see all of your knowledgebase categories organized on this same screen. 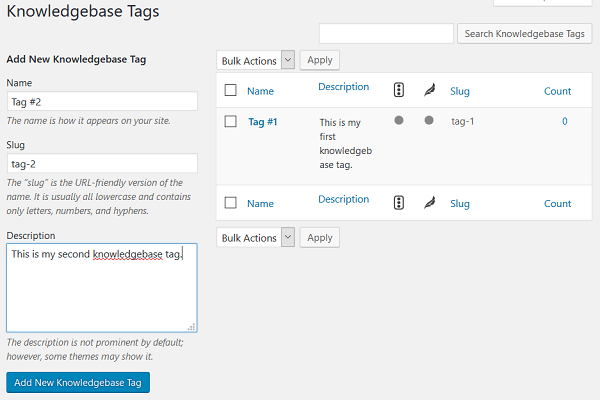 Follow this same process but in the Knowledgebase > Tags section to create specific tags for your knowledgebase. Keep in mind that as you grow your knowledgebase, you will be able to continually add more categories and tags as needed. To add a knowledgebase article, select New Article from the Knowledgebase menu item. Here, you will see a Visual Editor, much like the one you would see while drafting pages and posts for your website. Notice the categories and tags that you defined specifically for your knowledgeable are available for use. After drafting your article, click Publish. Upon activating WP Knowledgebase, you had the option to have a knowledgebase page automatically created for you. If you opted for this, all of your knowledgebase articles will automatically be placed on that page. As you can see, my categories are clearly displaying for site visitors to see, and each article has their own clickable icon for viewing the content. As your knowledgebase begins to grow with additional content, it is likely you will want to rearrange the articles to fir under appropriate categories. Luckily, WP Knowledgebase makes this very simple. 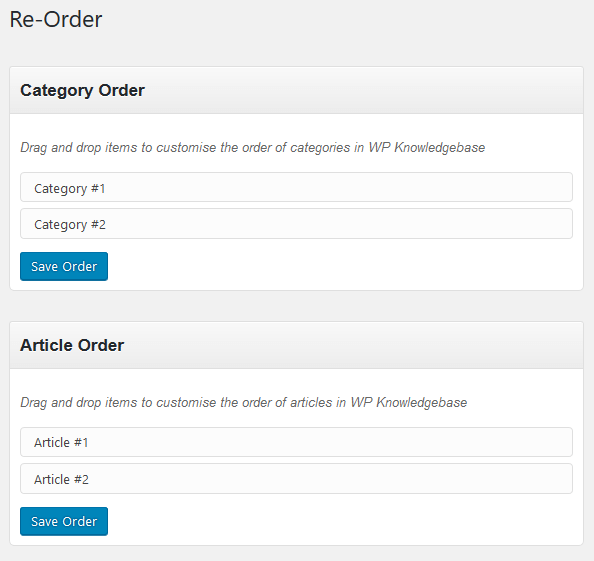 Simply use the intuitive drag & drop interface to re-order your categories and articles into whatever order you see fit. Again, this makes adding additional content very easy. In addition, it saves you loads of time when it comes to designing how your knowledgebase displays to site visitors. In the end, creating a knowledgebase for your WordPress website, especially if you run an online shop, is very beneficial to not only your site visitors, but you as well. It has tremendous SEO value, is a great supplement to any kind of support you offer customers, and is a great way to establish yourself as a solid authority in your industry. If you are looking to add a knowledge base to your WordPress website, I highly recommend using the intuitive, and simple to set up WP Knowledgebase plugin. It has enough features to get the job done correctly and offers basic customizations to match the look of your brand. Plus, it helps attract customers seeking information about you and your business. Have you ever used WP Knowledgebase on your WordPress website? I would love to hear all about it in the comments below!